Make your next party or event unforgettable! 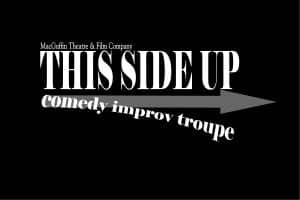 Invite This Side Up to keep you in stitches—and create a one-of-a-kind experience! Call 215-922-1141 for a brochure or to book us for your event. 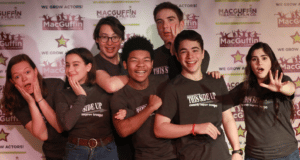 Who: A group of 4-8 seasoned teen comedians from MacGuffin Theatre & Film Co, directed by Jen Jaynes. 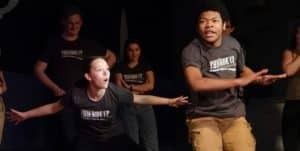 What: We perform improv games seen on the hit TV show, Whose Line is it Anyway? – and our own invented routines, too. With suggestions and interaction from you, the audience, we set our clever wacky games into motion. Where: We tour in Philadelphia and its suburbs, including New Jersey. When: We perform between November 1 and May 31. Current Performers: Rachel Burnett, Brenden Dahl, Jake Karwoski, Isabella Martorano, Henry McCullough, Ellie McKeown, Lex Meisel, and Rafi Mills. Free for non-profit organizations with a 501(c)3 status (donations accepted). Please call 215-922-1141 for booking, a brochure and/or general information.